When Tim Westergren started the Music Genome Project in 2000, the goal was to analyze the musical details of thousands of songs by studying them one at a time. The result was Pandora, free Internet radio that plays music specifically suited to your taste, without commercial interruption. Start by picking a band or better yet, a particular song you adore, and it scans a massive trove of music to play other tunes you'll like. The company continues to grow like a weed, with practically every metric doubling year over year. Tim Westergren: Innovation is an absolute cornerstone of our company, for a number of reasons. It was innovative to start the Music Genome Project in the first place; that's the foundation of who we are. But when you're a small company, what you lack in scale you have to make up for by being a step ahead of the competition. So we have to innovate in 360 degrees – in terms of our playlists, how we use technology, how we structure advertising, and marketing, because we don't have a big budget. 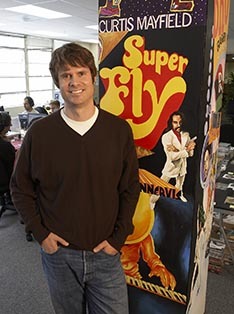 Tim Westergren: The iPhone application for Pandora. It's been a real game changer for us, not only in terms of creating a viral tool, but in the way it's redefining Internet radio. There was Internet mobile radio before, but it was essentially broadcast radio in another form. It didn't really change things for consumers, and you still had problems with drop-outs, sound quality, etc. This is really the first effective, elegant mobile instance of Internet radio. We're getting over 20,000 new iPhone listeners per day since we launched in July '08. Tim Westergren: We do hire some outside consultants, but our innovations are mostly internal. We get a steady stream of input every day from thousands of listeners. I also hold town hall meetings all over the country, which is an informal way to get people together for an evening. Tim Westergren: No, I'm not. Tim Westergren: I keep a pretty steady finger on the pulse of digital industry – TechCrunch, Silicon Alley Insider, “Bits” from The New York Times. I read that stuff daily. Tim Westergren: We don't have any institutional processes for that. All I can really say is that we encourage interaction. We hire smart and motivated people with a lot of initiative, and we empower them. Tim Westergren: I think the biggest hurdles to employees being effective are interpersonal. People need to be feel confident and valued and happy in their workplace. Frequently that's not the case. People are either afraid of speaking up, or they don't care enough to speak up, or organizational dynamics sap people's enthusiasm and confidence. I think that if you can do the opposite – empower, validate, acknowledge – then you have people who really want to contribute and shine. Tim Westergren: By far the most difficult one has been the royalty situation. Pandora operates under a federal license that, among other things, establishes a royalty rate for us. A year and a half ago, a copyright tribunal in Washington, D.C., decided to massively hike those rates, on the heels of lobbying from record labels. It would ruin our business if it weren't fixed. We've been fighting it for a year and a half; it's life or death for us. Most surprising thing is we've been able to turn the decision back through the combined strength of our listeners. We organized a massive grassroots political campaign that applied so much pressure, Congress intervened and forced record labels to renegotiate. We're very close to getting it done. And I'm optimistic.